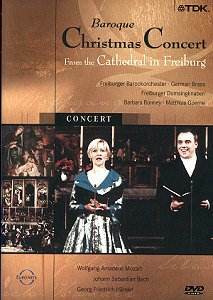 "Wacht auf, ihr Adern und ihr Glieder"
"Ehre sei Dir, Gott gesungen"
"Herr, dein Mitleid, dein Erbarmen"
"Grosser Herr, o starker König"
This brief (60 minute) DVD is a "concert" of Christmas music by Bach, Mozart and Handel, featuring two fine soloists, Barbara Bonney and Mathias Goerne. The pieces are all excerpts from large works - from Bach's Christmas Oratorio, from Handel's Messiah, and others. There is little thread holding this recital together, though the tone of the music is similar throughout. Barbara Bonney is very good in the Mozart, an excerpt from the Mass in C minor. Her voice blends well with the excellent sound of the original instruments, especially the flutes and oboes. But while she sings well, she doesn't do any more than that - there is no special feeling or emotion that comes across in this piece, nor in most of the other pieces. The Bach is all competently performed, and the orchestra gets its "solo" playing the sinfonia from the Christmas Oratorio, a bit limply, but, again, competently. Mathias Goerne sings his solo, from cantata 110, quite well, but the duet with her and Bonney suffers from their voices being drowned out by the oboes; in addition, they voices don't work well together. This piece, which should be the high point of the performance, is uneven and uninspiring - Bonney and Goerne seem at odds with each other, and at odds with the instruments accompanying them. This DVD includes a couple of pieces for a brass ensemble - quite nice, if you like that sort of thing - and two traditional Christmas songs performed by a children's choir. These two pieces are sung, first, over films of people walking in the streets of a city (Freiburg), which is quite shocking after the shots of the interiors of the magnificent cathedral. The camera then returns to the cathedral to show the choir singing, but one may wonder what the director had in mind. The high point of this disc comes when Barbara Bonney sings Handel's He shall feed his flock, from the Messiah. While not perfect - a hint too much vibrato - her voice is well-suited for a song like this with its jumps and long notes. She is a bit overwhelmed by the orchestra again, unfortunately, but this is a very profound performance. Unfortunately, the disc then ends with a performance of the oh-too-familiar "air on a G string" by Bach, from his Orchestral Suite in D Major. What a shame to follow the Handel with such overplayed music, and ruin the tone that Bonney managed to achieve. In the end, this DVD is too short, and features too much of a mixture of different types of music to be truly interesting. Barbara Bonney's Handel might make it worthwhile for true fans of this music, but that's a high price to pay for just one song.